I left Oaxaca after my 2012 visit, completely smitten. I came home and started looking at the VRBO sites to find a place for rent. After months of searching for “The RV of My Dreams” following the sale of my Atlanta home, I was just about ready to give up hope of finding one that felt right. 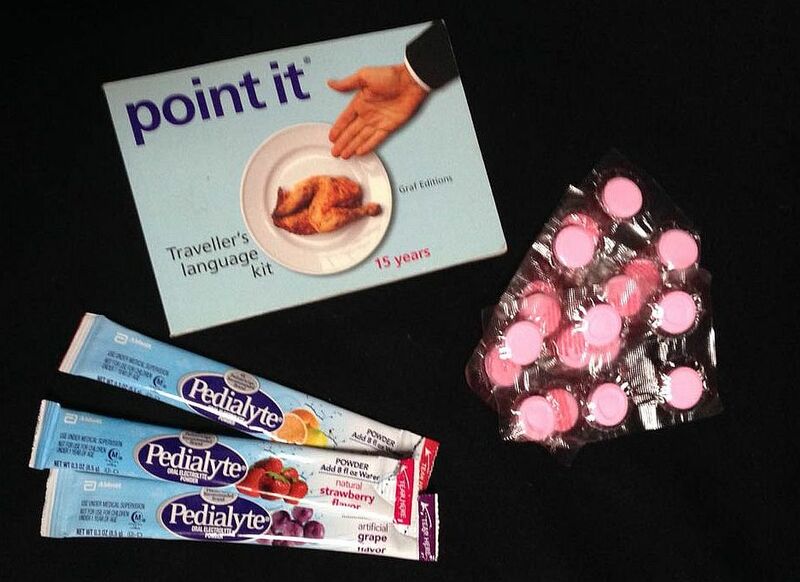 So working remotely from Mexico to escape the winter seemed like a distant second when it came to lifestyle choices. I was looking forward to repeating this experience on this visit to Oaxaca, saving back some of my vacation Peso budget for a few “big splurges” in some of the more famous restaurants that I had enjoyed during our last visit. However the change in atmosphere was palpable, particularly among the more notable restaurants. Not only were the prices incredibly higher during the holiday season (Was $120 pesos, or $10 USD, for a dessert of flan at La Olla a menu misprint???) But the wait staff seemed to turn a bit of a cold shoulder if the table ordered anything less than three courses. Of the “Top Restaurants” where we had dined in 2012, the food seemed to be smaller portions, higher prices with fewer extras for the table, such as fresh chips and salsas. In some cases, it seemed that the restaurants were trying too hard to be “chic and upscale,” like La Biznaga drowning a perfect flan in cajeta (carmelized milk) chopped pecans, and mescal, until you could no longer even tell it was flan. 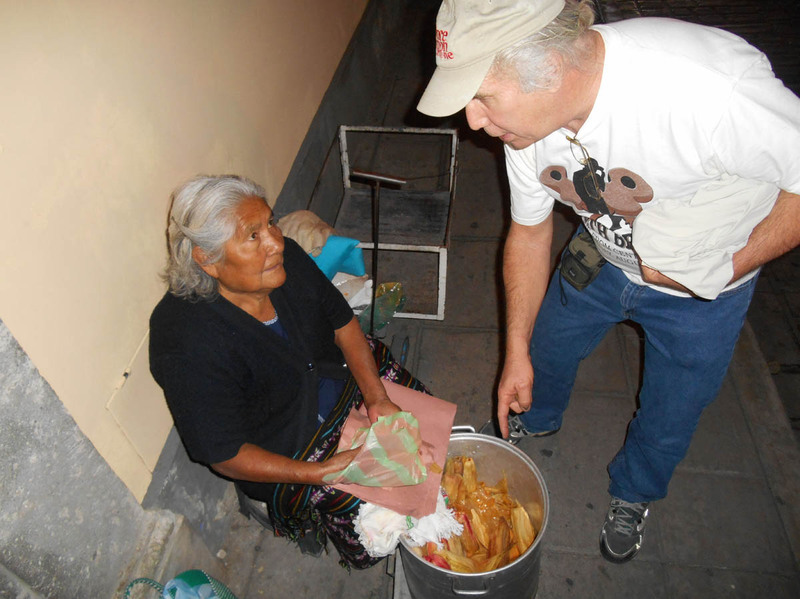 Homemade tamales from the “Tamale Lady,” located on the corner every night from 5pm to 8pm. We took off to explore a different side of town in the opposite direction from the pedestrian streets of the beaten tourist trail, and found the Parque El Juarez el LLano. This massive plaza offers a plethora of local restaurants, cafe’s and food carts to stretch your Pesos, as long you are willing to stretch legs and your Spanish skills as well. 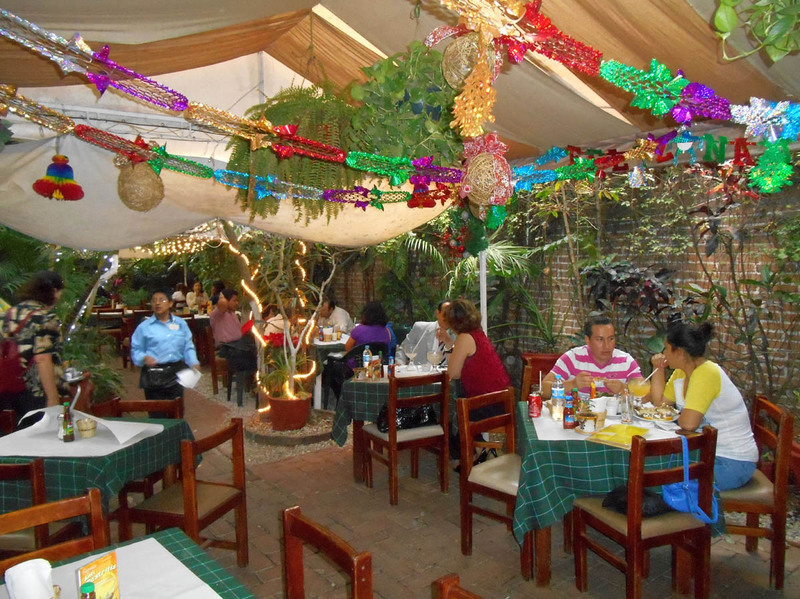 The best exception to the scaled back holiday offerings was Marco Polo, a small outdoor restaurant specializing in seafood. 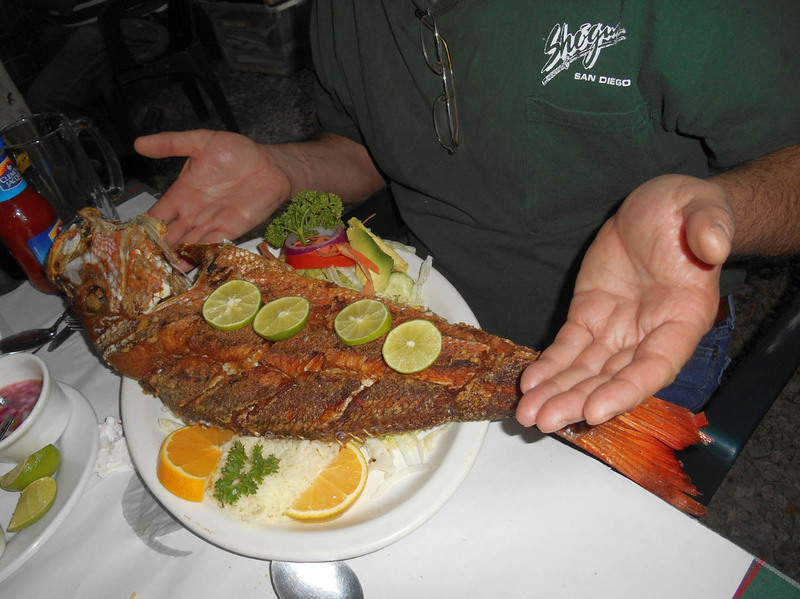 They had fresh red snapper on the menu by the kilo, so Don asked the waiter, “What is your smallest red snapper you have?” Out comes a plate of two “beeeeeeeg fish!” for us to choose from! We decide to split the smallest one, about 4.5 pounds, asking that it be scored and fried. The crust came out crispy golden brown on the outside, and the fish flesh was sweet and succulent, the best we agreed we had ever tasted! By far, the most memorable meals we had were around this park, blocks from the main tourist area. 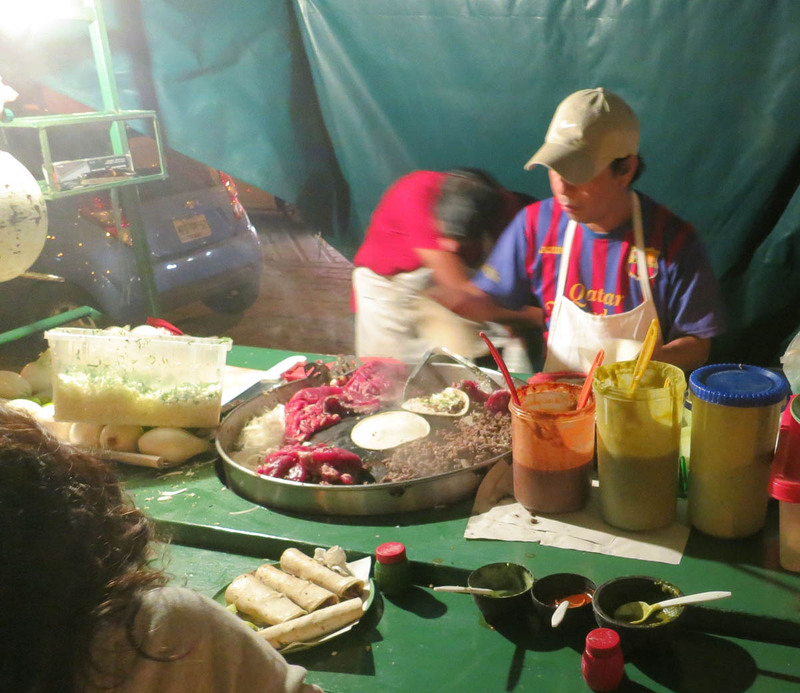 I had some of the best street tacos I have ever enjoyed from a vendor along the Parque El Juarez el Llano. He was mass producing these tacos a dozen at a time with lightening speed with a blurrr of hands, yet every single one was rolled to perfect proportion. 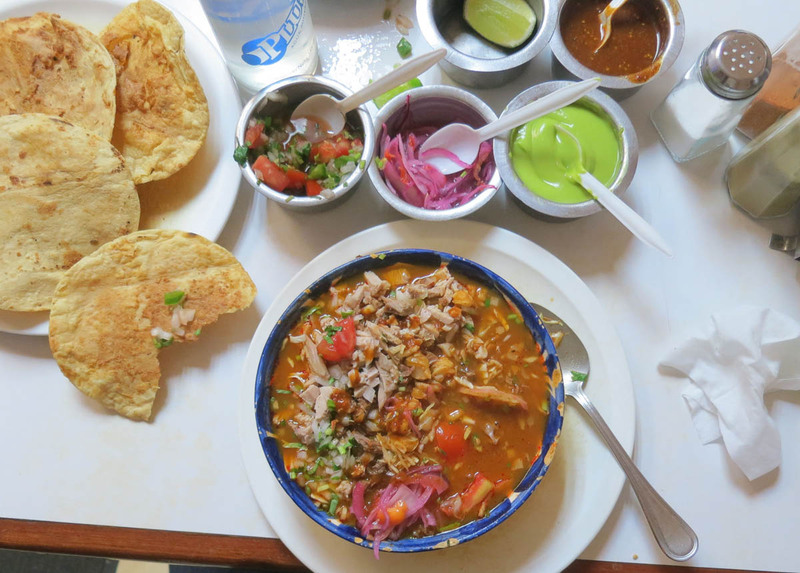 I also had the best pozole I have ever tasted from “Tacos Alvaro,” located in the same neighborhood. It was bubbling hot, with all the right condiments from oregano to chili powder to adapt it to one’s own spice tolerance. This entry was posted in Oaxaca and tagged La Biznaga, La Olla, Marco Polo, Parque El Juarez el Llano by Suzanne. Bookmark the permalink. That is aways how I like to explore .. living like a local. I avoid the touristy places as much as possible. irks me when I find a once eclectic mom and pop kind of town turned into a cutesy artsy fartsy … look how sophisticated we are now … place. just hate that. sure is colorful there and I am amazed by your eating street-vendor food. When I was there … we were told to never do that. soooo, obviously good stuff has happened so people can eat whatever from whoever. interesting. there is no way in living breathing hell I could pick a fresh fish with its head and eyes and eat it… none… zero zip nada. even your description of crispy outside and fleshy insides… aw, man? … lol… I tell ya I just continually get closer and closer to being a total vegetarian… I don’t like my food looking at me. Hi, Carolyn, Somehow those “can’t eat anything with a face” genes just didn’t ever stick with me. I think it was growing up on a cattle farm, it was just such a natural part of our lives, that eating meat is in my bloodstream. 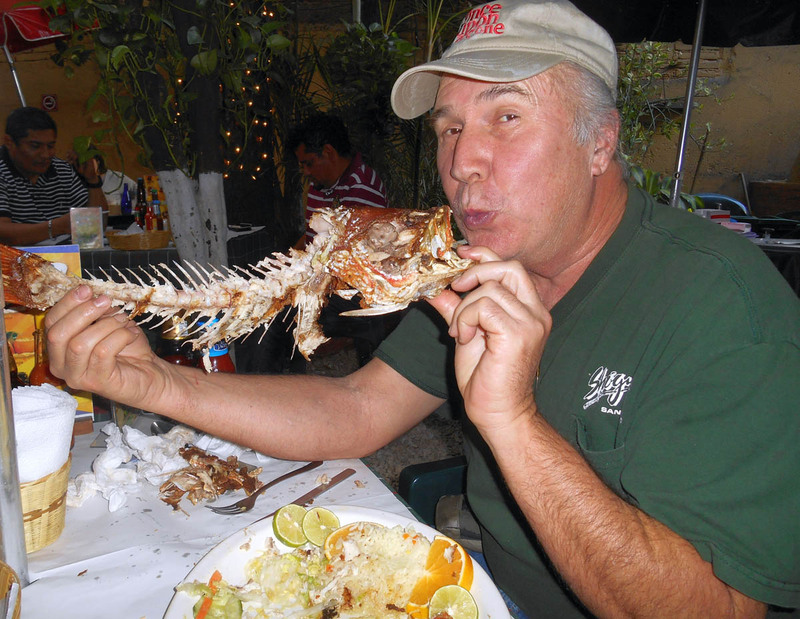 As I was eying up carne asada in Mazatlan, Lynne called me “The Cowman’s Daughter.” LOL! I do admire and respect those who make the conviction not to do so, though. 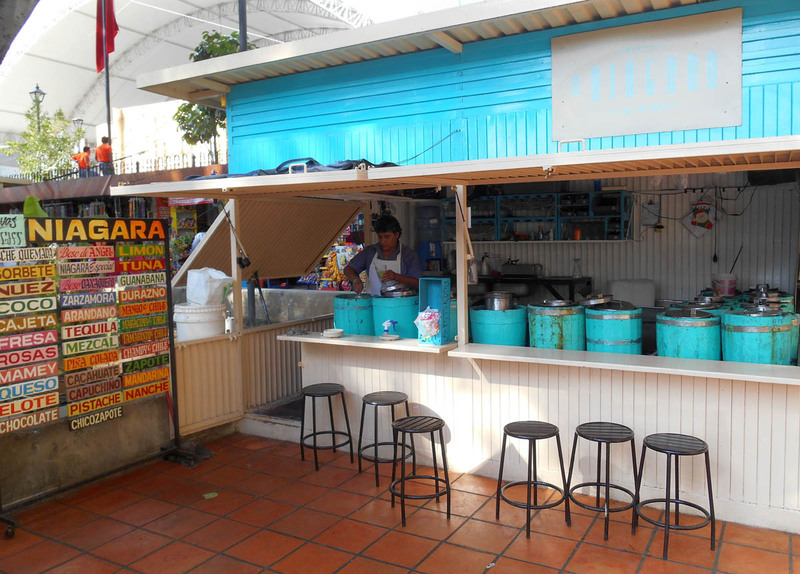 I still remember the first time I ate a street taco in Mexico. It was about 15 years ago, and I was in Mexico City on a business trip. The street was lined with taco vendors, and it was like “forbidden fruit,” as I too had been warned never to eat “off the street.” I was so hungry, did not know any restaurants nearby, and with warnings from hotel security, I was too scared to wander too far. The taco stand was right outside the hotel, and the aroma was just intoxicating, so I decided I would roll the dice and see what happened. What happened? I enjoyed a really great taco! Been eating them every since, and never had a bad experience (knock wood!) Thanks for the comment. Living here in oaxaca 9 years I never eat at any of the “in” restaurants. Exceptions might be Origin on Hidalgo or Asador Vasco when I have a craving for great lamb. Next time you are here, explore further. The emapandas that are baked over a wood fire at Merced Market, the omg out of this world tamales at the Etla market, tostadas supreme at the corner of Hidalgo and Manual Doblado, the empanadas of chicken and mole amarillo in Ocotlan, the chiles en nogada at Azucena Zapoteca – you have the best stll waiting for you. Wow, Teri! I wish I had known you a week ago! Those empanadas sound heavenly!! And I love lamb, so I know I would have enjoyed Asdador Vasco. I will certainly keep this information on file, as I most surely will be back. Maybe not for New Years, but I have so much of this beautiful country yet to explore! Thank you for commenting! Teri is right. 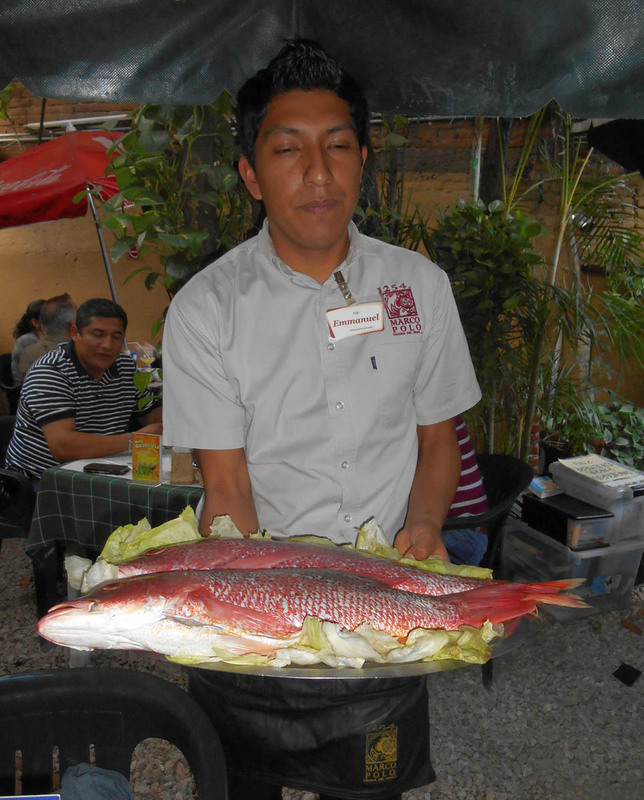 The best authetic Oaxacan food can usually be found in the smaller local and street ‘restaurants’. That is not to say that some of Oaxaca’s more famous chefs (like Pilar Cabrera of La Olla) are not doing justice to Oaxaca’s reputation for world-class adaptations of trditional Mexican recipes. In my opinion there is way too much old-fasioned hype about not eating street food here.Next time, come and stay here at the San Felipe campground and we will have a day of sampling the best authentic Oaxacan cuisine. So glad that you found the real Oaxaca gain. Best to stay away from the tourist areas other than the site seeing parts. I can’t believe that you have two new ‘friends’ awaiting your return.